Preheat your oven to 160°C (320°F) if it's a fan/convection oven, 180°C (356°F) conventional, or gas mark 3. Mix the flour, rice flour or semolina, sugar and salt together in a bowl. Make sure your butter is at room temperature. Cut it into small bits and rub then into the flour mix with your fingertips. Keep on rubbing until you have a mixture that looks like coarse sand. Butter the inside of a baking tin about 20cm (8 inches) square. Lightly press the sandy mixture into a single layer - get the top as flat as you can, and bake for 25-35 minutes. The top should not be coloured much, and should feel firm when it's baked. Take it out of the oven and let it cool down in the tin. Melt the butter in a small saucepan on medium-low heat. Add the condensed milk, syrup and sugar. Stir constantly and bring it to a simmer. Let it cook for about 10 minutes. It should thicken up a bit and take on a light brown colour. When the sauce has cooled, pour it over the shortbread base. Put in the fridge to set. When ready, break the choclate into pieces. Reserve about 4-6 chunks, put the rest in a small bowl and microwave for 30 seconds. Stir the chocolate, then give it another 30 seconds. Repeat this 4-5 times until the chocolate is all melted. Add the reserved pieces and stir until the residual heat of the chocolate melts them. Pour the chocolate over the caramel sauce and leave to set. Remove from the tin and cut into squares or fingers. The video above is from the Keef Cooks YouTube channel. 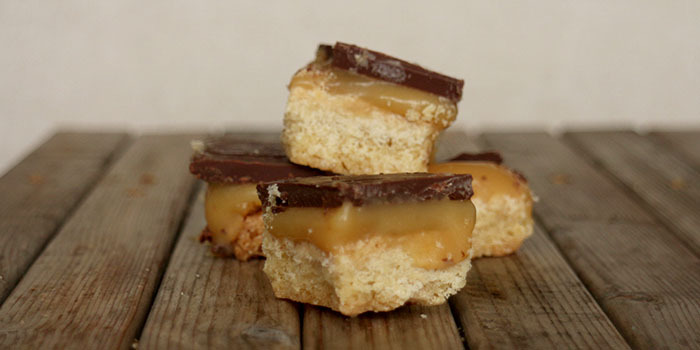 Click here to see the video recipe of Millionaire\'s Shortbread on YouTube. Prep time: 10 minutes. cooling/setting time: 1 hour. Total time: 1 hours 45 minutes.